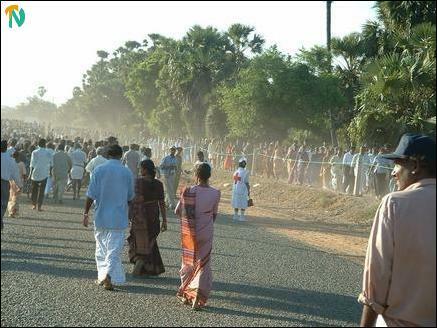 Elections officials in Jaffna said Friday that thousands of voters from Kilinochchi walked a kilometre in scorching sun across the line of control between the areas controlled by the LTTE and the Sri Lanka army in the southern part of peninsula to cast their ballot. Polling was higher than sixty percent in the clustered booths in Sri Lanka army’s clearing zone for commercial vehicles, according to them. 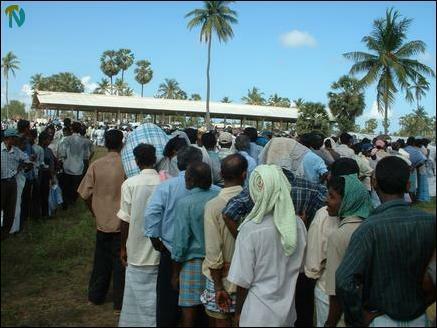 People voted with unprecedented enthusiasm in the Sri Lanka military controlled parts of Jaffna. Polling, however, averaged at 42-45 percent, according to officials. There should be 644279 voters in Jaffna according to the revised electoral register for 2002. But the actual figure is less than four hundred thousand, mainly due to large-scale displacement and emigration. Hence polling percentage appears as low despite the alacrity of the voters who are present in Jaffna. Very few incidents of intimidation were reported during the day, Police sources said. Cadres of the paramilitary group EPDP who attempted to threaten voters with firearms were assaulted by them near the polling station at Muruhamoorthy Vithiylayam in Araly Central Friday afternoon. The military opened the Muhamalai checkpoint for voters at 6.30 a.m. - half an hour before polling started. The Sri Lankan army kept away from the polling area. Only Sri Lankan Police units were present. 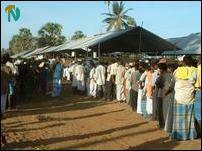 People from LTTE controlled areas cast their votes in sixty-one polling booths in Muhamalai. The booths were meant for 63700 voters from Kilinochchi and Vadamaradchi East. Polling was delayed until noon at two centres in Muhamalai as EPDP election agents and an ex MP of the paramilitary group continued to raise objections that many voters were impersonators. The Senior Polling Officer (SPO) there resolved the problem by asking the Village Officer for the area to confirm the identity of the voters and by checking their national identity cards. The EPDP refused to accept the SPO’s decision and walked out of the centre. Meanwhile, activists of the EPDP and Independent Group No. 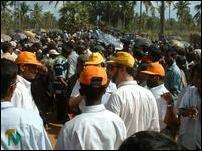 2 (Jaffna) distributed propaganda leaflets to voters who were standing in long queues to cast their votes in Muhamalai. They went away after voters strongly objected and argued with them. Six persons were arrested by the SLA in Pt. Pedro Friday evening around 5.30 p.m. near the Siththivinayagar School.